My friend from North Carolina was in the West Hollywood area for a weekend and wanted to hang out/do lunch, so I used the handy-dandy powers of Yelp to figure out places near her to eat. After compiling a list of places, I offered the choices and her immediate answer was "pizza" so off we went to this 4-star dig and meet up with some of my friends who were on standby for a lunch location. The first thing we noticed was that it was a nice hole-in-the-wall type of place. Then we noticed the CASH ONLY sign and the well-priced pizzas. So we opted to go with a mix of the Marco and the Hawaiian pizzas (one half being ham & pineapple while the other half being mozzarella & ricotta cheese with meatballs). Before the pizza came out, one of my friends ordered the garlic bread to share with everyone. It was fantastic and nicely toasted. The garlic was rich and definitely not scanty. In fact, in addition to the garlic butter, there were pieces of garlic on the bread. Delish. The pizza came out, and it was huge! As my friend correctly pointed out, it was pretty much $1 per inch ($20 for a 20-incher). It had a thin crispy crust that everyone agreed was great. The slices were pretty huge (as you can see from my picture of it compared to the size of my unattractive-eating-face). The Marco pizza tasted very much like a lasagna pizza because of all the ricotta cheese. I have to give it to them for getting together great ingredients with which to top the pizza. Everything was fresh too. I only had half of a normal slice of the Hawaiian because I was feeling the weight of my first slice in my stomach. It was pretty good but actually nothing spectacular. What really made the pizza shine overall was the crust. 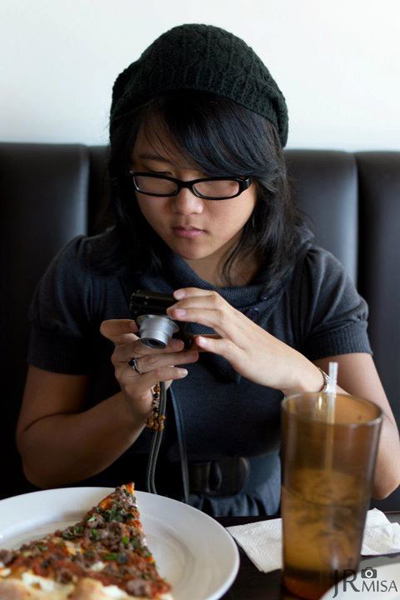 Just for kicks, here's a picture that my friend took of me hard at work for this here blog =P. See what I do for y'all?